Jovis, 5 die Januarii; 4° Gulielmi et Mariæ. SEVERAL of the Members, according to the Order of the Day, delivered in at the Table several Lists of Names of Commissioners, to be inserted into the Bill for granting to their Majesties an Aid of Four Shillings in the Pound for One Year. 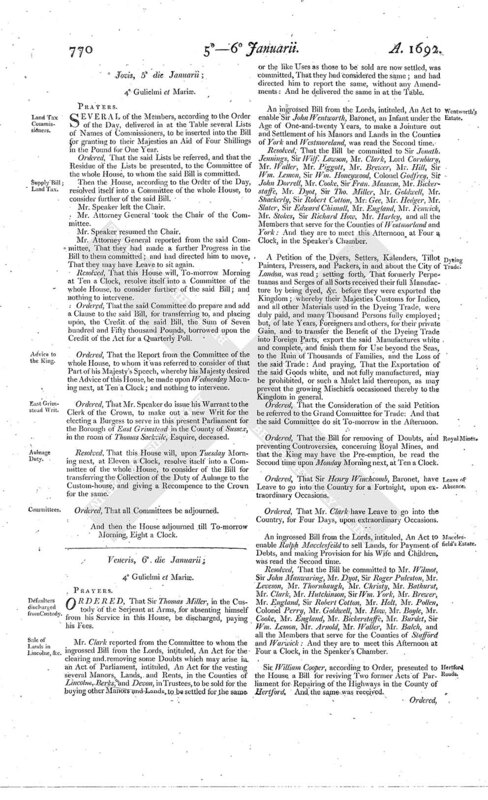 Ordered, That the said Lists be referred, and that the Residue of the Lists be presented, to the Committee of the whole House, to whom the said Bill is committed. Then the House, according to the Order of the Day, resolved itself into a Committee of the whole House, to consider further of the said Bill. Mr. Attorney General took the Chair of the Committee. Mr. Attorney General reported from the said Committee, That they had made a further Progress in the Bill to them Committed; and had directed him to move, That they may have Leave to sit again. Resolved, That this House will, To-morrow Morning at Ten a Clock, resolve itself into a Committee of the whole House, to consider further of the said Bill; and nothing to intervene. Ordered, That the said Committee do prepare and add a Clause to the said Bill, for transferring to, and placing upon, the Credit of the said Bill, the Sum of Seven hundred and Fifty thousand Pounds, borrowed upon the Credit of the Act for a Quarterly Poll. Ordered, That the Report from the Committee of the whole House, to whom it was referred to consider of that Part of his Majesty's Speech, whereby his Majesty desired the Advice of this House, be made upon Wednesday Morning next, at Ten a Clock; and nothing to intervene. Ordered, That Mr. Speaker do issue his Warrant to the Clerk of the Crown, to make out a new Writ for the electing a Burgess to serve in this present Parliament for the Borough of East Grimstead in the County of Sussex, in the room of Thomas Sackvile, Esquire, deceased. Resolved, That this House will, upon Tuesday Morning next, at Eleven a Clock, resolve itself into a Committee of the whole House, to consider of the Bill for transferring the Collection of the Duty of Aulnage to the Custom-house, and giving a Recompence to the Crown for the same. Ordered, That all Committees be adjourned.